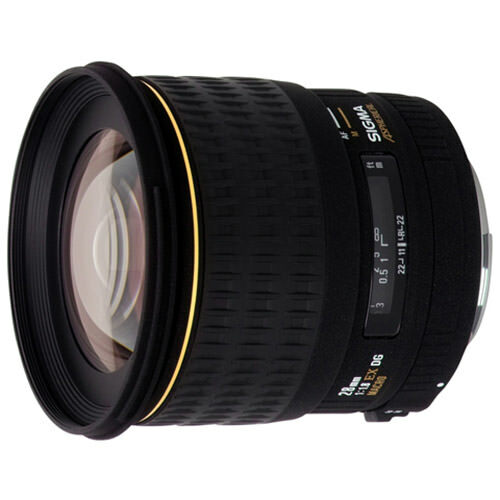 Lens Description: This large aperture wide-angle lens can be used for both digital and 35mm film SLR cameras. It has macro focusing capability with a fast F1.8 maximum aperture, which is ideal for Digital SLR cameras. With a minimum shooting distance of 7.8 , reproduction ratio of 1:2.9 and a 75.4 degree angle of view, you can not only take pictures of the subject but also the surrounding scenery. Also, the iris diaphragm has 9 diaphragm blades to obtain beautiful out of focus images in the foreground and background. Sigma s advanced optical construction utilizes a floating focus system and two aspherical lens elements for superior peripheral brightness and compensation of aberrations and astigmatism. Super Multi Coating reduces flare and ghosting that tends to occur when using digital SLR cameras. The Dual-Focus (DF) mechanism eliminates the need for the front of the lens to rotate during auto-focus. The wide, textured, rubberized focus ring conveniently moves forward to click into AF position and back to select manual focusing. Also, this also allows the use of a Petal-type Hood and the easy use of a polarizing filter.